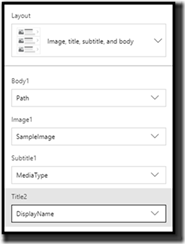 One of the more common request we have seen from customers is that they want to use PowerApps and use Azure Blob storage to store their media files. So far, this has not been possible out of the box – and customers have had to use workaround using a custom API (https://powerapps.microsoft.com/en-us/blog/custom-api-for-image-upload/ ). Well, no more. 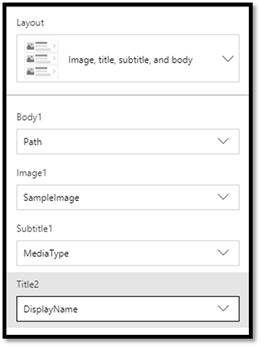 With this update, you can now directly use the Azure Blog Storage connector from PowerApps to load or save images and other media. Not only that, you can share the app with users – and they will be able to use your app without you having to share the account keys to y our Blob store. Let me show you how to quickly build an app where you can display and upload images from/to your Blob store. We will use two Gallery, the first one to browse a container, and the second one that displays the files in the selected container. Finally, we will use some of the controls to show the user the files in your blob storage. 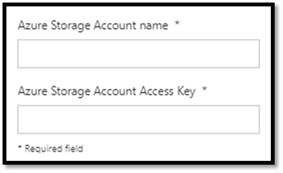 Select the Azure Blob Storage connector and fill in the details that you created. Your app can now display files from blob storage into a gallery, now let’s add a way for users to upload new files to blob storage. You can now try out your blob storage app by playing the app, uploading a file, put a full name (with the extension) in the text box and clicking on the button. Do not forget to change the popup window filter to All Files (button right) when it pops up (if you are trying this out from a browser). Now that you can have users upload files or use the camera / pen and other controls to send the files to Azure Blob Storage, you will want to show those files back to users. You can check the Media type or file extension to show or hide several types of controls on your canvas. 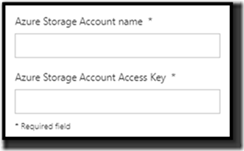 You will want to secure your Azure Blob Storage files. Each container can have a different Public Access Level assigned to it. 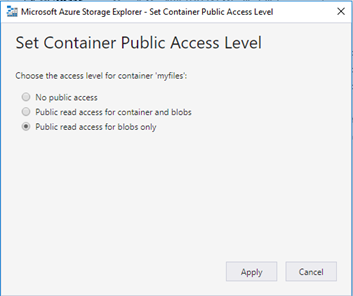 In Microsoft Azure Storage Explorer, you can click on a blob storage container, go to the actions tab on the bottom left of the screen and view your access settings. The first setting (no public access) will restrict access from viewing / downloading the file even if the user has the URL to that file. If you want to lock down your files online, this is the setting you need to select. If you select that option and click Apply, you will notice your app may stop showing you any images. 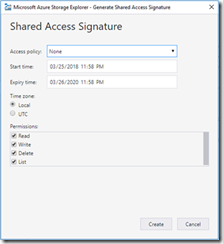 To secure your files and allow your app to show them to your users, you will need to setup a Shared Access Signature. This will assign a key to all the files in your container and will not allow them to be shown unless a special key is appended to the URL. 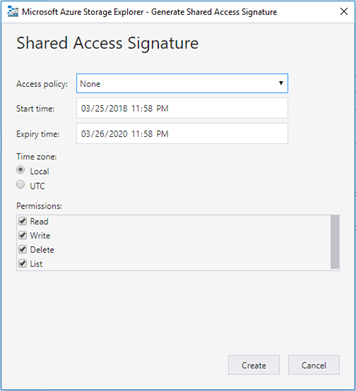 In Microsoft Azure Storage Explorer, you can click on a blob storage container, go to the actions tab on the bottom left of the screen and navigate to Get Shared Access Signature. Set the expiry time to a date in the future. This will create a key when you click create that will expire based on the date time that you set in the box. Your key will stop working on this date. Copy the Query string on the next page to use it in your app. In your app append the query string to the end of any URL in a control where you are viewing an item. You can do this in the app directly (not recommended) or store the key in a different data source and use that data source to insert into the key. If you need to lock down your files and have a URL you can send to an outside customer, you can use the CreateShareLinkByPath function. This will lock down the file to a period you can set and generate a URL for that file that can be used by users outside of your app. 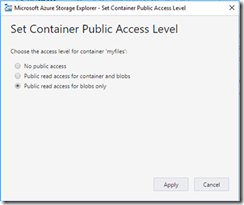 You can now create or update your apps to include Azure Blob Storage files. You can lock down the files if you would like to and show your users the supported files back in PowerApps. After your app is made you will want to share that with your team. The wonderful thing with this connector is when you share the app, your team will get access to use the connector automatically and will not have to bring their own key to access the blob storage. With the previous version you would have to give each team member your access information to allow them to use it. If you are currently using the Azure Blob Connector in your app it will continue to work. As you share your current app with other team members it will continue to work as it did before. If you need to update your app that will also continue to work. However, you will not be able to add new Excel data source from your blob storage. As you add Azure Blob Storage to your apps, you can begin to leverage all the power of the Azure Platform. We are excited to release this functionality to you, let us know what you think.